The ONE+ 18-Volt Lithium-Ion Cordless Combo Kit (8-Tools) has all the tools you need to tackle any types of drilling, driving, cutting, and grinding application. Featuring the ONE+ system, all of the tools included works with any ONE+ batteries and chargers, allowing you to have the ultimate versatility in over 70 tools selection to get your job done. The RYOBI 18-Volt ONE+ Combo Kit (8-Tools) includes: P208B drill/driver, P237 impact driver, P514 reciprocating saw, P507 6-1/2 in. circular saw with 24-tooth carbide-tipped blade, P551 7-1/4 in. miter saw with 24-tooth carbide-tipped blade, P523 jig saw, P340 JobPlus multi-tool, P704 area light, P107 compact lithium-ion battery, P108 high capacity lithium-ion battery, P118 charger, tool bag and operators manuals. Impact driver: 3-speed selector switch adjusts torque to power through a variety of applications (high speed 1800 in. lbs., medium speed 1100 in. lbs., low speed 400 in. lbs). FEIN MultiTalent cordless 12V oscillating multi-tool. A universal system for interior construction and renovation featuring Starlock mounting system, QuickIN accessory change, and electronic speed control. Contains the basic accessories for sanding and sawing to cover general applications. Widest selection of available accessories for a huge range of applications. The 2695-22 M18 2-Tool Combo Kit includes the 1/2-inch Hammer Drill Driver (2607-20) and the Hackzall M18 1-Handed Reciprocating Saw (2625-20). The M18 Cordless System's patented technologies and electronics, innovative motor design and superior ergonomics provide the most efficient blend of power, weight and performance in the industry. Powered by REDLITHIUM, the M18 cordless system delivers more torque, more power and longer run-time than the competition. 18V ONE+ Lithium-Ion Cordless Combo Kit (8-Tool) The ONE+ 18-Volt Lithium-Ion Cordless Combo Kit (8-Tools) has all the tools you need to tackle any types of drilling, driving, cutting, and grinding application. Featuring the ONE+ system, all of the tools included works with any ONE+ batteries and chargers, allowing you to have the ultimate versatility in over 70 tools selection to get your job done. 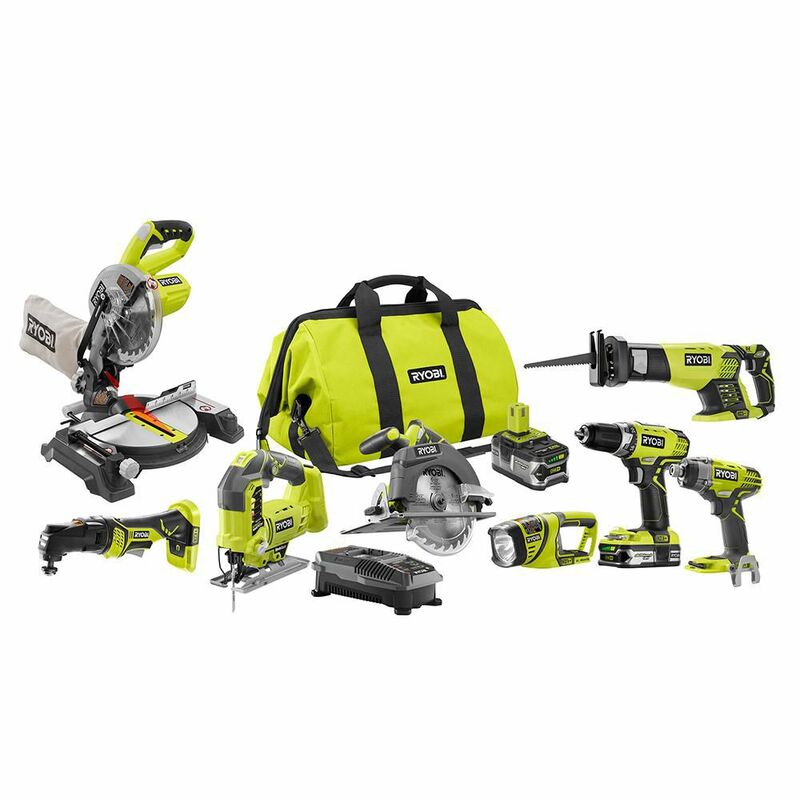 The RYOBI 18-Volt ONE+ Combo Kit (8-Tools) includes: P208B drill/driver, P237 impact driver, P514 reciprocating saw, P507 6-1/2 in. circular saw with 24-tooth carbide-tipped blade, P551 7-1/4 in. miter saw with 24-tooth carbide-tipped blade, P523 jig saw, P340 JobPlus multi-tool, P704 area light, P107 compact lithium-ion battery, P108 high capacity lithium-ion battery, P118 charger, tool bag and operators manuals. 18V ONE+ Lithium-Ion Cordless Combo Kit (8-Tool) is rated 4.6 out of 5 by 61. Rated 5 out of 5 by DJ from I haven't had a chance to use everything yet but... I haven't had a chance to use everything yet but the tools I have used have performed great! I picked the Ryobi line because I have always had great performance from their products. I also have the the battery powered lawn mower and weed eater and they work great as well.I have never been let down with their products and they are at an affordable price that the non-professional home user can purchase without breaking the bank. Rated 5 out of 5 by dpadilla from I was comparing several other Combo Kits and decided to go with Ryobi because of the price and to... I was comparing several other Combo Kits and decided to go with Ryobi because of the price and tools. Rated 5 out of 5 by Richard from Excellent assortment of power tools with numerous features at an... Excellent assortment of power tools with numerous features at an unbelievable price, great Value! What are the sizes of the batteries included? The kit picture seems to imply one high capacity and one compact. Is that the case? Hi Rolf, This kit includes a P107 compact lithium-ion battery and a P108 high capacity lithium-ion battery. doe's it all fit in one bag because I travel for work, ? Hi there, yes all tools fits in the bag except the miter saw. The Ryobi Team.